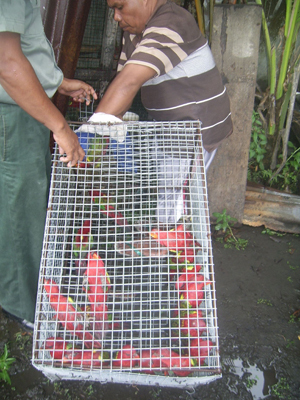 The Forestry Officers confiscated 27 Chattering lories (Lorius garrulus) from a dealer in Tobelo, North Halmahera, Maluku Island, Indonesia on 9 August 2010. The parrots were about to be smuggled outside the Island. The officers succeeded in foiling the smuggling during their patrol to the area. On 22nd May 2008, ProFauna launched an investigation report called the Pirated Parrots revealing the smuggling of 10,000 parrots per year from North Halmahera of North Maluku. Following the launch, ProFauna has been actively encouraging the government to enforce the law. 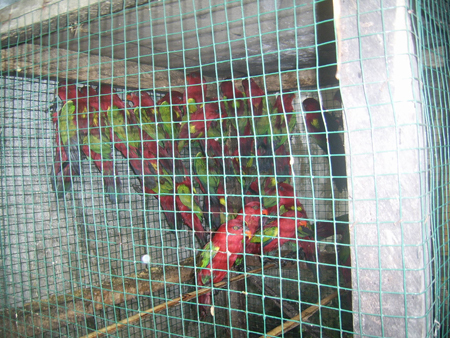 The authorities have succeeded to foil the parrot smuggling, including one to the Philippines. After having being quarantined and medical check-up by the forestry veterinarian, the parrots were healthy and ready to be released. Not to mention that the dealer and forestry officer stated that the parrots were recently caught from the wild. For these reasons, the birds should be released to the natural habitat. 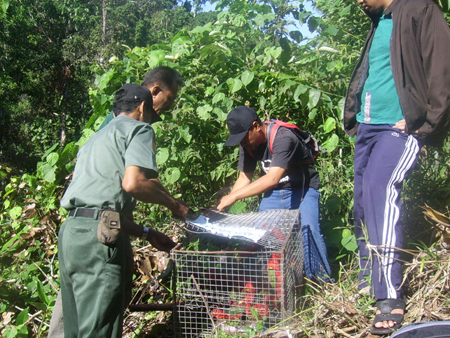 The release was held on 15 August 2010 in Halmahera forest in North Maluku by the forestry and police officers of North Maluku, ProFauna, and a local conservation organization. The released parrots flew right away to the trees. The officers would monitor the released parrots. ProFauna would like to thank the World Parrot Trust that supported the release. ProFauna has been actively working together with the local government, forestry department, local people and communities on parrot protection in Maluku. We will keep you informed on our parrot campaign in Maluku.